The mission of The American-Scottish Foundation®, an international not-for-profit organization, is to establish links and strengthen ties between Scotland and the United States, through the pursuit of contemporary social, cultural, educational, and business activities. 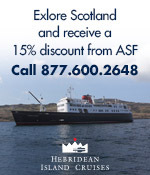 The mission remains as relevant today as when ASF was founded in 1956 by Lord Malcolm Douglas-Hamilton – to champion the extraordinary relationship between the peoples of Scotland and the United States – a bridge between the two great countries – seeking to strengthen & support the future of the Scottish American diaspora, and its legacy. The ASF Crest, Semper Scotia, Wallace Award, Scotland House are the registered trademarks of the American-Scottish Foundation, Inc.